I’m going to tell you a secret that shoe retailers and your shoe repair man don’t want you to know. 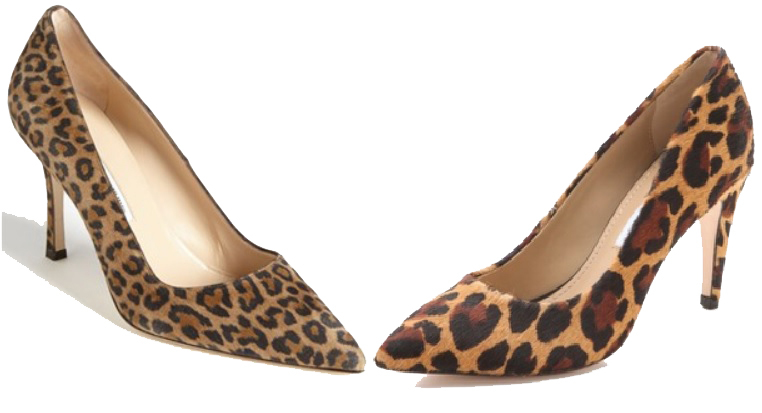 You can turn your dated round or almond toe shoes into a classic pointed toe pair, and you can do it yourself. 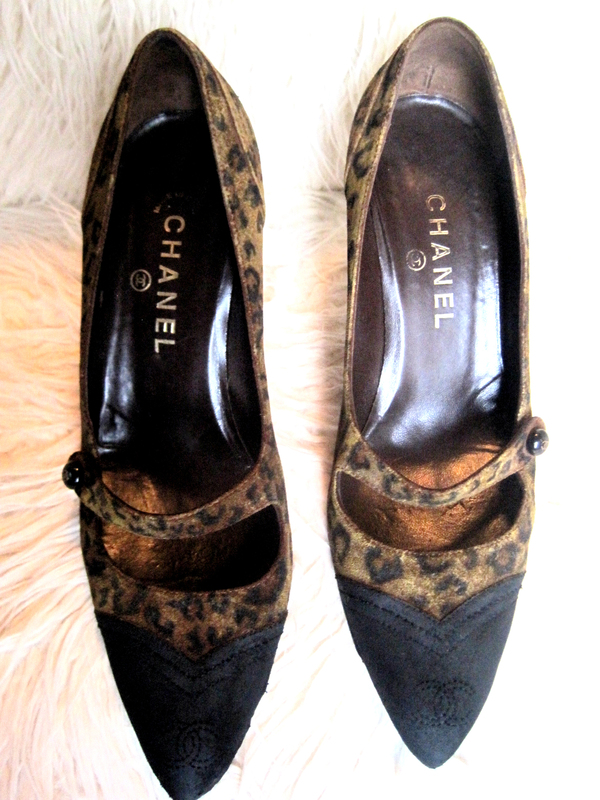 I had this pair of brown suede Chanel mary janes. 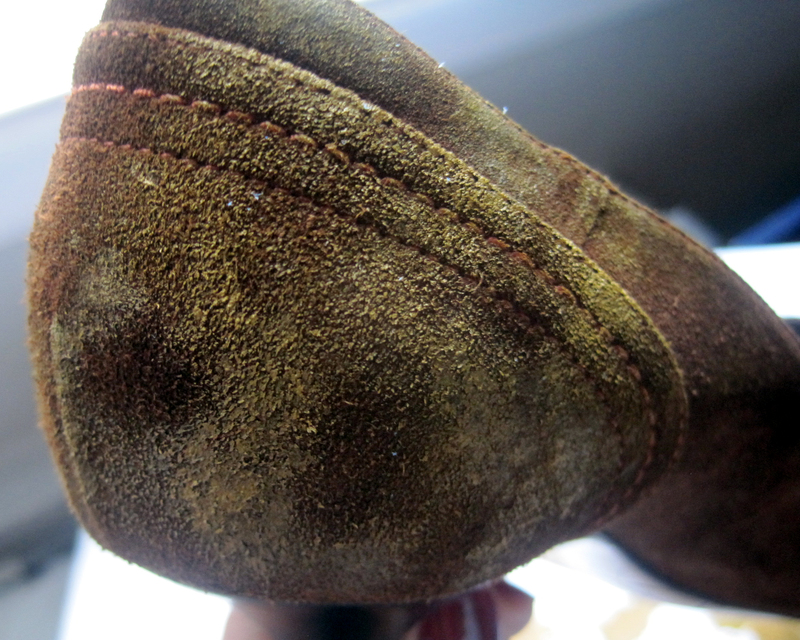 The suede had seen better days and the almond toe pump was dating them far more than the few scuffs. However, I have a sentimental attachment to those babies, so I thought I would take a crack at giving them a little makeover and hopefully give them a second life. So I killed two birds with one DIY project. I bypassed my shoe guy and decided to look under the hood of my beloved but outdated babes, and I am so glad I did. 1. As always, make sure your shoes are clean and free of any debris. Take your metal nail file and insert it slowly between the toe of the shoe and the sole, twisting slightly up and down to pry the sole off of the shoe. 2. Separate the sole from the shoe till you reach about halfway down to the ball of the foot area. You’ll see the suede wrapped around the insole. Use the metal nail file to pry the suede that is wrapped around the insole away from the insole while keeping the suede and the insole in tact. Once its detached, pull the insole toward the bottom sole so that they are matched up against each other. 3. 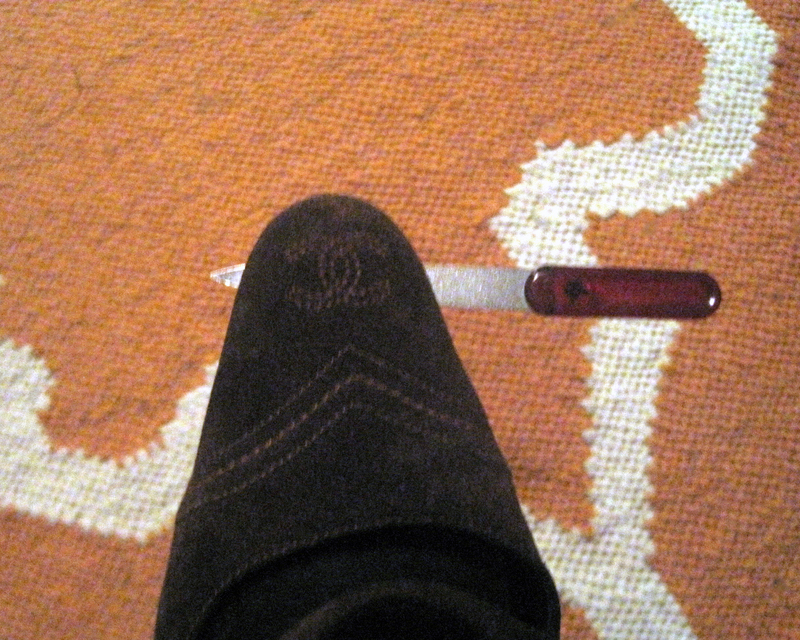 Use your pencil to draw your pointed toe and cut the out sole first. 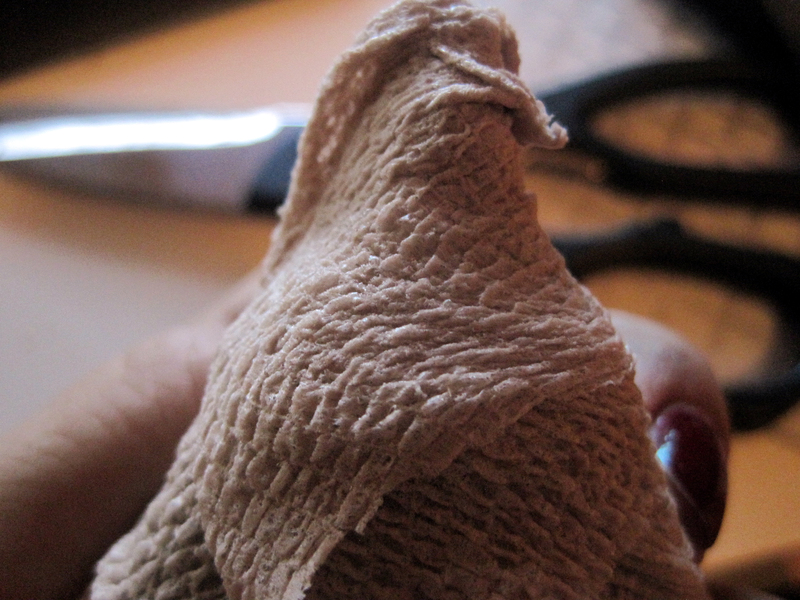 Measure the insole against the cut and trace it with the pencil, and cut the insole to match. 4. Generously apply the Shoe Goo to the insole facing the out sole and the edges that were wrapped around the insole using a paintbrush. 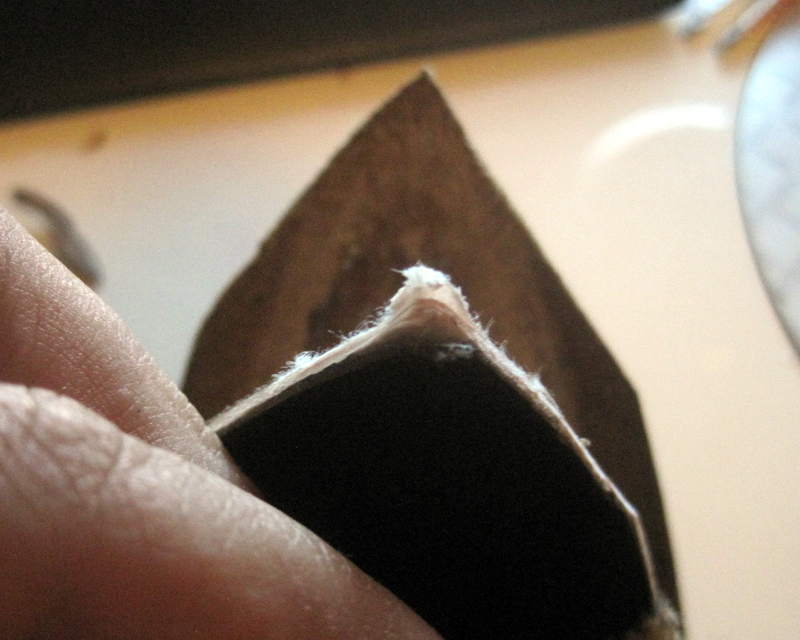 Pinch the suede around the insole to fit to the shape of the new pointed toe. 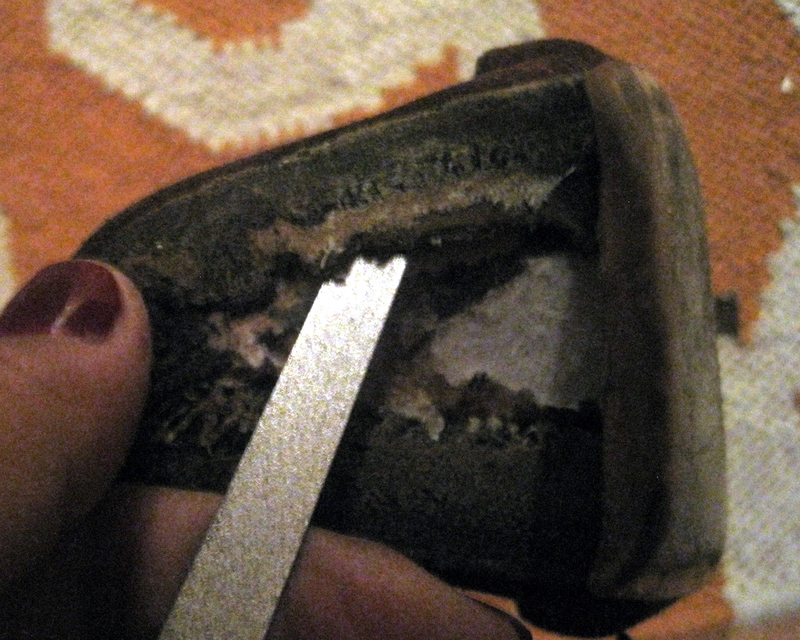 Keeping the toe pinched with your fingers, stick the out sole to the suede and the insole. 5. Still keeping one hand holding the shape, take the self adhering tape and wrap the toes of the shoes together tightly like a mummy. This helps the new toe shape stay put while it drys. Repeat this process on the other shoe. Let them dry overnight. 6. Unwrap the athletic tape and if there are any gaps between the suede and the out soles, fill them in with the shoe goo. 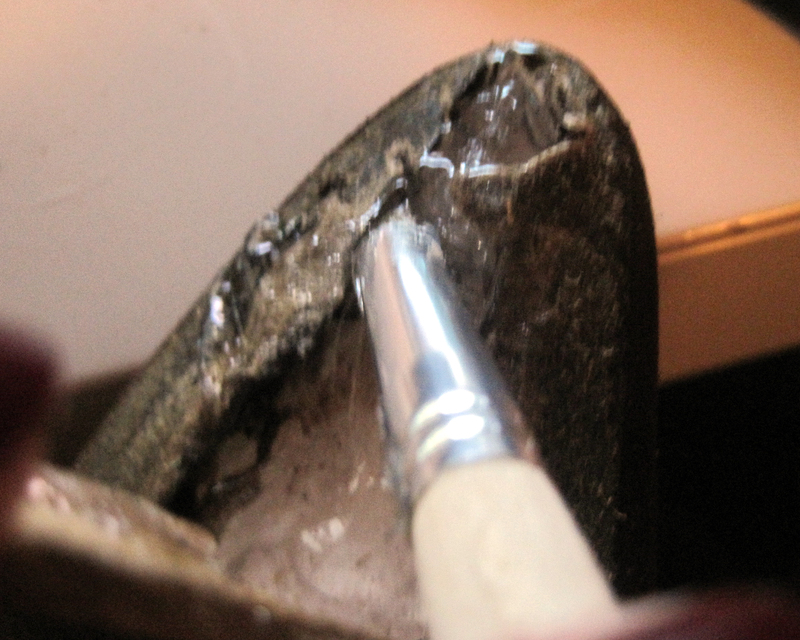 If there is any shoe goo on the suede, rub it off using the sandpaper. 8. Continue this process on both shoes. Midway through my painting I decided to make a black cap toe on my pair. I wasn’t getting the sheen and opacity I wanted with black shoe polish, so I used black acrylic paint and smoothed it in using my fingertip. Worked like a charm. 9. While you let the paint dry (it shouldn’t take more than an hour), use your black fabric paint marker to cover the heels (optional). 10. 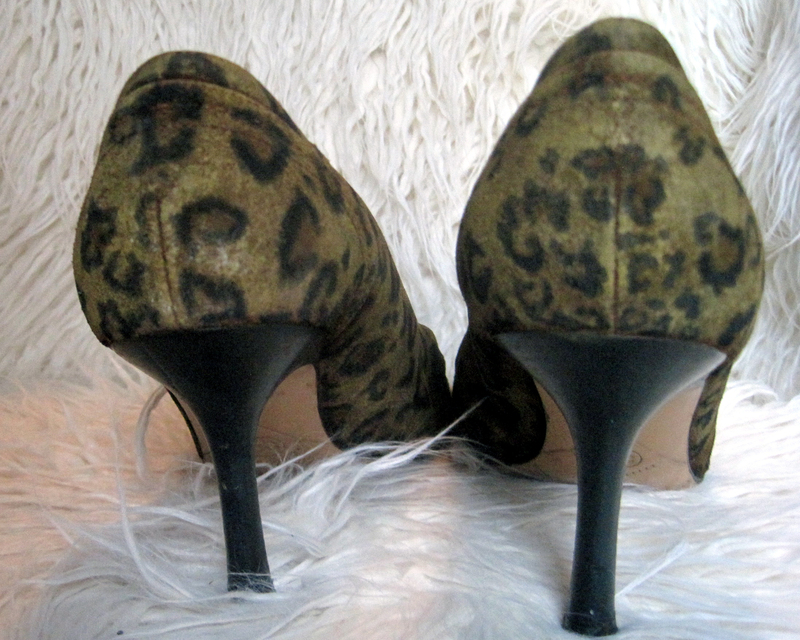 Once they are dry, draw your leopard spots using the black fabric paint marker. 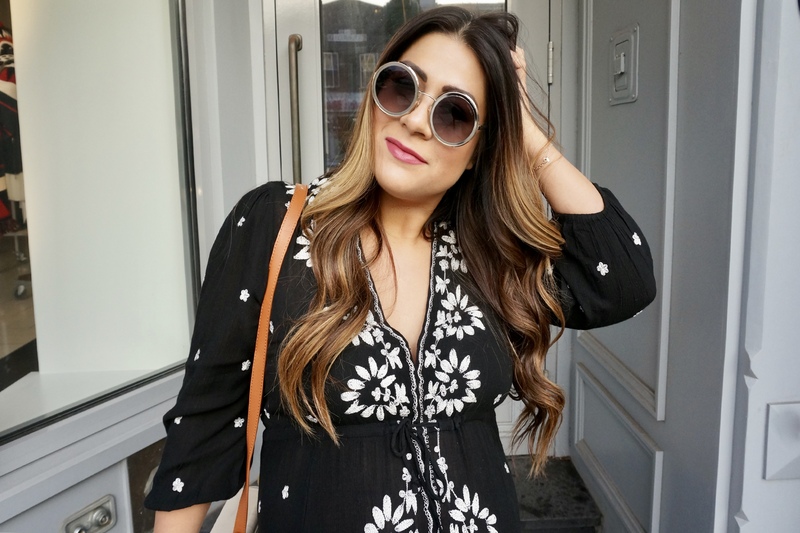 Make thick, patchy c shaped marks around the unpainted brown spots and small closed black spots elsewhere. Be wild with it, it’s supposed to be a random natural pattern. Enjoy your new upgraded shoes! 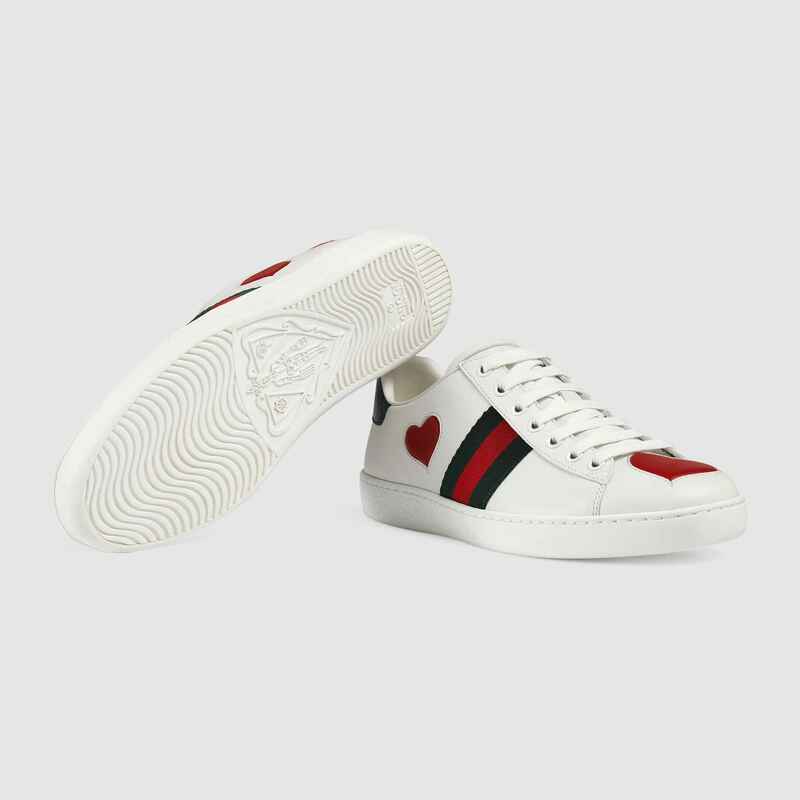 Have any shoe fix tricks? Do tell! OMFG you did this yourself? You are an artist, my dear. So proud of you and blown away! Thank you so much! I was surprised by how simple this was. You should try it! Send me pics if you do!